Before a viral video gets to the viewer, the clips are extensively edited, color-corrected and oftentimes auto-tuned to perfection prior to launching into the web for the world to see. 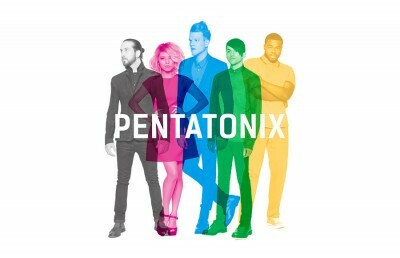 Though many are doubtful of these online musicians’ ability to deliver on a live stage, superstar a cappella group Pentatonix smashes and surpasses these expectations with a bombastic stage presence and cheerful demeanor, the members truly coming into their own as burgeoning musical icons. The Berkeley stop of the PTX World Tour on April 24 welcomed a mixed bag of Pentatonix supporters. From the avid Pentaholics, who handed out signs with various lyrics to “New Year’s Day” for the audience to wave during the group’s performance of said song, to the cohort of excited teenage girls wielding giant cardboard cutouts of the members’ heads, the crowd at the sold-out Hearst Greek Theatre was a testament to Pentatonix’s broad appeal. The night began in a lukewarm manner with 17-year-old AJ Lehrman performing for the half-full amphitheater. The young aspiring popstar seemed to be straight out of a Disney channel original movie, singing unimpressive covers of current hits, such as Selena Gomez’s “Hands to Myself,” and struggling to engage the crowd with his original songs. In the most bizarre turn of the night, Lehrman and his two-person backup band launched into an overly ambitious medley of random pop songs, singing hasty sections from tracks ranging from DNCE’s “Cake by the Ocean” to 2Pac’s “California Love.” Lehrman mentioned that the medley was not only his tribute to Pentatonix — presumably for their expansive range of diverse covers — but also his tribute to the late Prince, an artist whom, surprisingly enough, Lehrman did not cover in his wild musical romp. Focus remained at the foot of the stage when YouTube and Vine phenomenon Us the Duo appeared, the husband and wife pair of Carissa and Michael Alvarado eliciting excitable screams from the now-full amphitheater. Us the Duo is best known for its viral 6-second covers of popular songs, so those who only know of the group from its online presence may have been disappointed by the lack of covers in its live set — perhaps the duo should’ve traded setlists with Lehrman. Nonetheless, while it is often difficult for cover artists to engage audiences with their original work, the Alvarados impressed with their range of talent, switching off instruments and harmonizing effortlessly. If Us the Duo was still charting a course with its original music, Pentatonix was the trailblazer to follow. 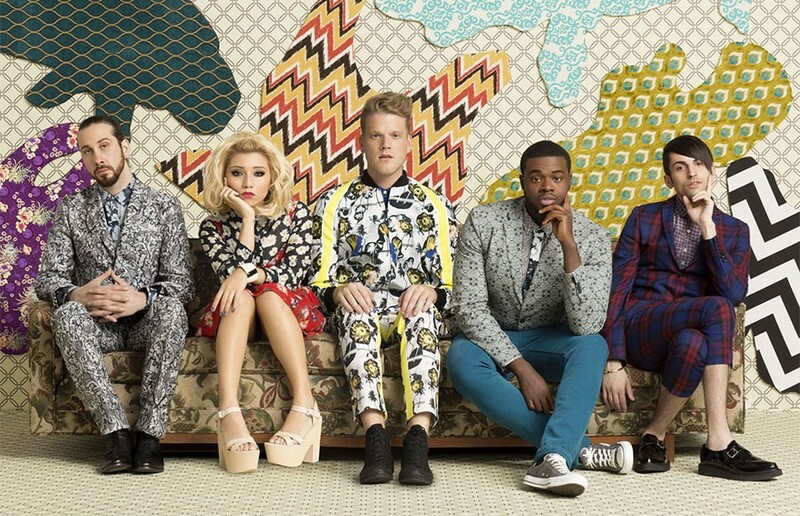 The quintet — comprising Scott Hoying, Avi Kaplan, Kevin Olusola, Kirstin Maldonado and Mitch Grassi — opened its explosive set with “Cracked” and “Na Na Na,” two original songs off its Billboard chart-topping self-titled album, the first of its albums to be composed of mostly original songs. Each of the members rose from an elevated platform with screens depicting images of their silhouettes, materializing high above the stage with a flash of light and thunderous applause. 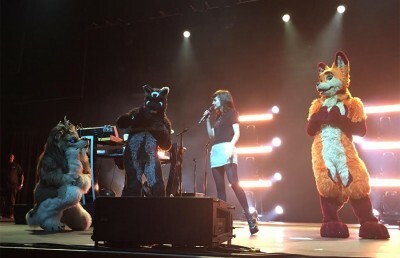 Some notable moments include a colorful and clean-cut performance of Pentatonix’s first original single, “Can’t Sleep Love,” which the group performed behind mic stands with cutesy choreography that was reminiscent of the Jackson 5. Fittingly enough, Pentatonix followed the track with a performance of its viral medley “Evolution of Michael Jackson,” the perfect balance of beloved classics. 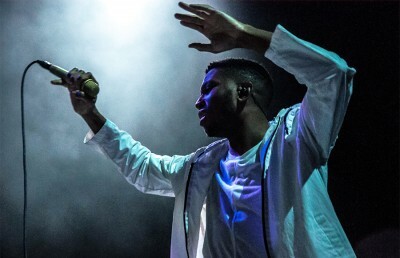 During the performance, beatboxer Kevin Olusola exclaimed, “It’s crazy that there are this many people here for an a cappella show!” The remark was genuine and the achievement is well-deserved, as the group’s innovative a cappella work is universally appreciated and showcases a deep appreciation and understanding of music. Pentatonix’s meteoric rise to the top is truly a testament to the fans it has amassed throughout its career, from being voted season 3 champions of NBC’s “The Sing Off” to garnering more than 1.5 billion views on its YouTube channel. It was fitting, then, that Pentatonix closed the night with the anthemic original song “Sing,” accompanied via video by dozens of fans who submitted recordings of themselves singing various parts of the song’s intricate a cappella arrangement. In just five short years, Pentatonix has revolutionized the landscape of a cappella and turned a small group of five extraordinarily talented singers into a collective of innovative musical superstars, with more than a few voices behind them.